The People Of Akoliufu Alayi In Bende Local Government Area Of Abia State are now living in Palpable Fears following the Invasion of their Farmlands on Wednesday 13th of July 2016 by Fulani Herdsmen. PUO REPORTS gathered that the People of Alayi woke up on the Early Hours of Wednesday to see their Farmlands turned into a grazing field without permission nor notice by the Herdsmen. We gathered that the Level of Damage is is high. Alayi People are predominately farmers that has maintained peace for years,but it appears that the latest invasion by the Herdsmen is targeted at provoking the Peace loving People of Alayi. 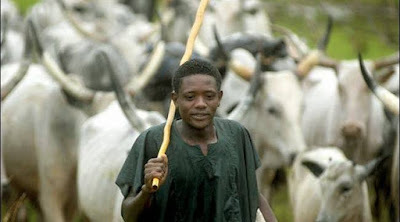 In the mean Time,the Lawmaker Representing Bende North State Constituency and Deputy Speaker of the Abia State House Of Assembly Rt Hon Cosmos Ndukwe has condemned the Invasion of Alayi Community by the Fulani Herdsmen. Hon. Ndukwe while speaking to PUO REPORTS on Telephone over the Ugly development assured the people of Alayi,that he will table the matter before the Abia State House of Assembly on Monday. Hon Cosmos who is also the Chairman House Committee on Boundary and Security Matters of the Abia State House of Assembly stated that it was a comdemnable act for Fulani Herdsmen to be Destroying Farm lands and farm produce at a time the state and federal government is encouraging farming as a way out of the current economic challenges facing the Nation.